The dog who just can’t stop sleeping! 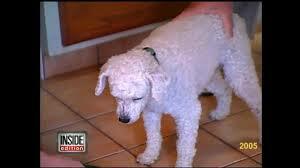 Skeeter is a poodle that suffers from narcolepsy. Although born totally normal, at 4 years old something changed and he began falling asleep standing up. Watch this amazing video of a very freaky dog.